Here's my haul from a recent trip to Value Village. This actually wasn't a great trip but luckily, I was on a mission to find some white bowls to use as succulent planters for our bookshelves. I've posted before about great sources for vintage accessories and now I'd like to share a few of my tips. 1. 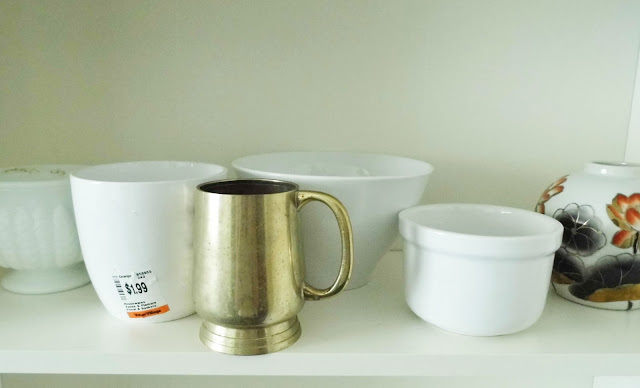 I like to begin with garage sales and thrift shops since these are the cheapest sources for most things. Antique retailers likely know popular collectibles (like milk glass) and mark them up accordingly. 2. Look at the shape and size of an item. Colour can be changed easily with a little paint. Furniture: Especially mid-century, deco or antique pieces. Pretty wine glasses: I am a total bull in a china shop so instead of using cheap Ikea glasses, I've decided to build my collection using random vintage glasses that catch my eye. 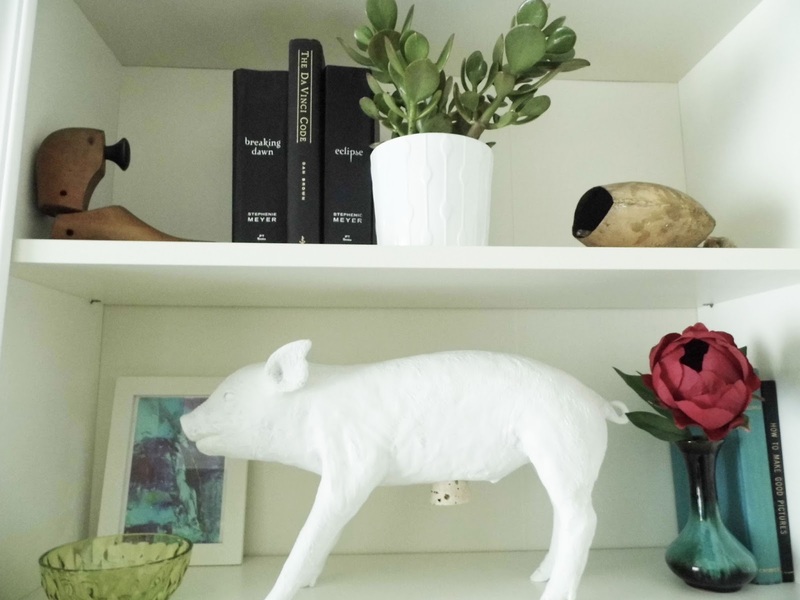 Pottery: I always trust my gut and only choose items I really love since there are many reproductions out there and I want to know that I like a piece independent of its worth. Milk Glass and Pyrex with Retro Patterns: They're fun and the milk glass adds lovely texture, while the pyrex is colourful. 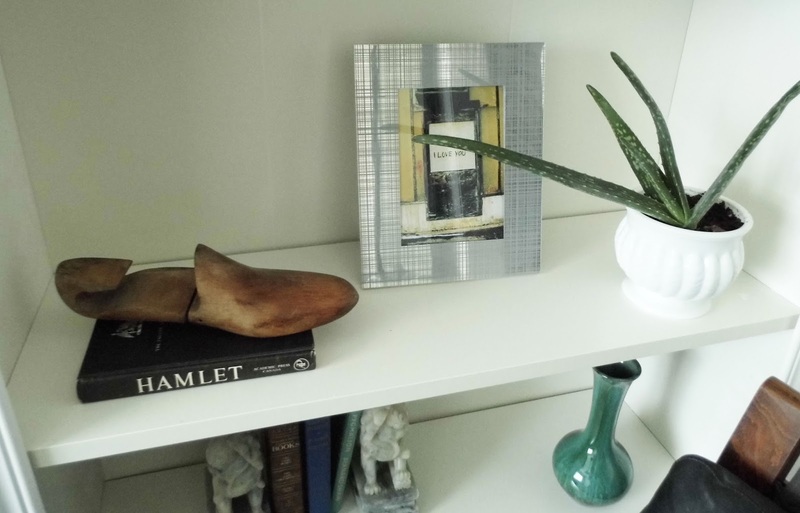 Vintage Books: I try not to be guilty of only buying books as accent pieces and so I try to choose books that are both beautiful and interesting. Metallic Objects: Right now, I'm loving anything in a warmer gold or brassy tone but there's some gorgeous silver out there too. Just grab some Brasso and fine steel wool and get to work! 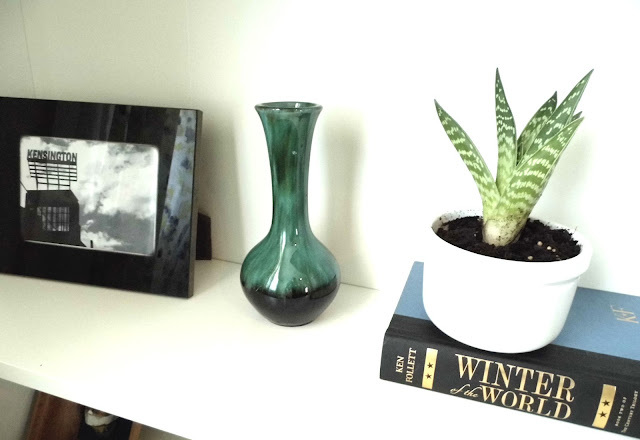 Containers: Anything that would house a small plant or another small object is usually easy to find a place for. Industrial Salvage Items: Shoe forms, glove molds, metal letters, pulleys... you get the picture! Anything Unusual: I'm always on the hunt for something truly unique and I like to keep an open mind for fabulous finds that may not be on my list. 4. Stick with your theme! ... With a few exceptions. 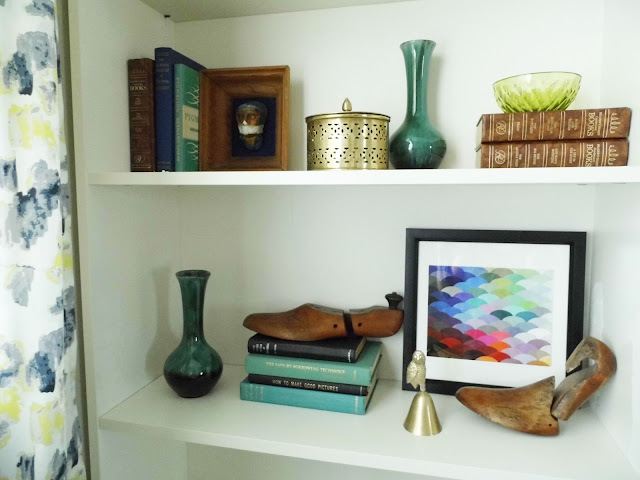 I'm trying for some controlled chaos in my bookshelf decor so I am trying to (mostly) stick with a theme of wood, gold toned metals, white, blues and greens and the odd "non-matching" object that really catches my eye. 5. Inspect before you pay! It's awful to go home and find a crack or chip in something. 6. Adhere to the 3:1 rule. This is usually my shopping rule and it serves me well. Before I reach the cash register, I put back one item for every three that I keep. 7. Think of other uses for objects. 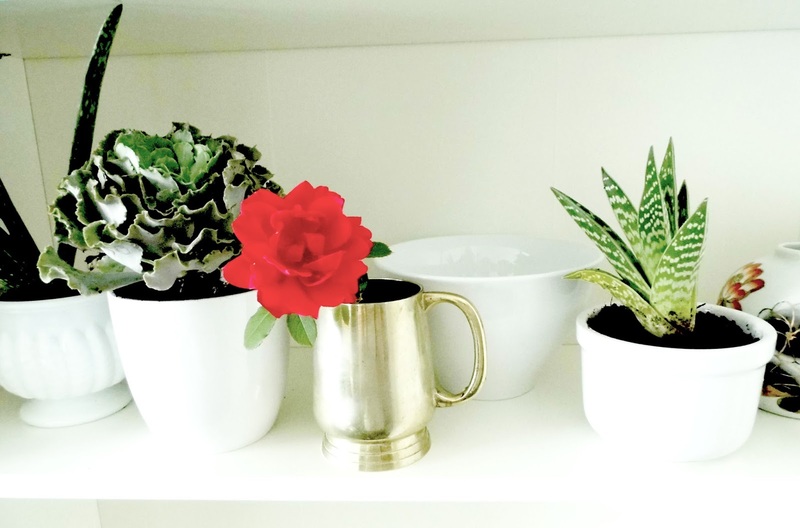 Bowls can make good flower pots; mugs can make good vases; a glass bowl flipped upside down can be a cloche; almost anything can house an air plant and most glass containers can be converted to a trendy terrarium. 8. Give back. Once you've finished decorating your home, the rule should be "One in, one out!" or you'll begin to look like a hoarder. Why not donate? Here's my haul from a recent Value Village. Sort of meh, right? Well, I had actually been specifically looking for some containers for succulents to add some green to our bookshelves or I probably would have walked on past these babies. They needed a good wash and the brass needed a GOOD polish. And here's what they look like styled with some plants. (Thanks Nancy and Jen! xo) That brass stein is going to serve as a funky bud vase. And here are the treasures from another recent thrifting spree: *minus the framed print from Society 6, which is obviously not vintage.